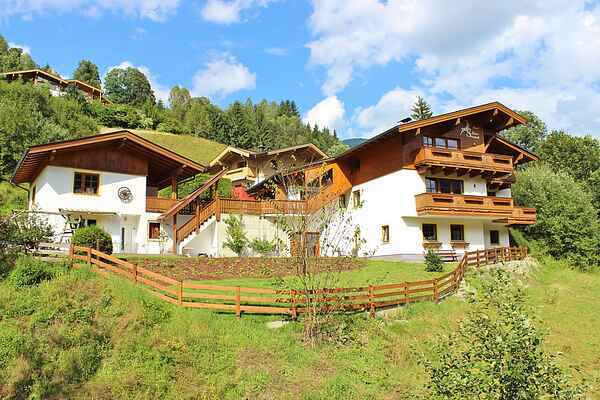 Close to the well-known Saalbach Hinterglemm, in the cosy village of Viehhofen, this beautiful chalet, completely renovated in 2016, sits in the sun on a slope. The Chalet consists of 3 separate apartments and a detached holiday home, all of which are at your disposal. Perfect for families travelling together. All apartments are tastefully and luxuriously furnished and feature a modern kitchen, several luxurious bedrooms and modern bathrooms. Each apartment has its own balcony or terrace with a beautiful view. In one of the appartments is one of the bedrooms accessible through the central hallway; it's located on the mezzanine. In this bedroom are a total of 4 beds of which 2 in a sleeping loft. They're extremely suitable for children (because of the low altitude). Because some living rooms also offer sleeping options, you can tailor the layout to fit your family. Because your apartment is located a bit higher than the village, you'll enjoy plenty of privacy, and a stunning view. The location is ideal for a winter or summer holiday. The ski bus stop is located just underneath the (slightly sloping) access road so you'll be in the beautiful ski area of Saalbach Hinterglemm in just a few minutes. In summer, there are plenty of possible leisure facilities like mountain-biking, hiking or a true recommendation: rafting. The lake of Zell am See is very near and will give you a delightful refreshment on hot days. New development! Starting from the winter 2019/2020, there will be a lift from Viehhofen directly to the skiing area of Zell am See. This will mean that Viehhofen will be both connected to the skiing area of Zell am See and with Saalbach-Hinterglemm through an ascent from the skiing area (the lifts of the skiing area of Saalbach Hinterglemm can easily be reached with the free ski bus). The expectation is that there will be ski buses to both skiing areas. Do not forget your snow chains! Slightly sloping access!